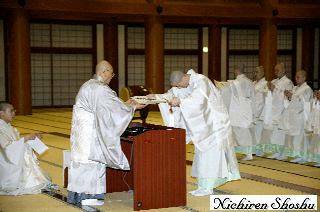 On April 27, the Ceremony of Appointment for Nichiren Shoshu priesthood was solemnly held at the Kyakuden Hall of the Head Temple. 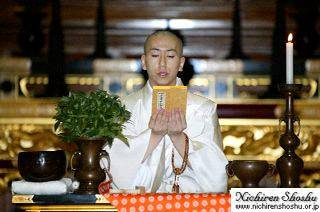 Fundamentally, a priest is permitted to make a religious speach for believers after the 11 years practice as a student, and in the Ceremony of Appointment he may make the first speach as a Nichiren Shoshu priest with the attendance of the high priest. After 15 priests over, His Highness gave them the licence of teacher.